When it comes to preserving memories of your family, there's only so much you can do to cling on to the days gone by. It's wonderful when you can have a special memento, though. 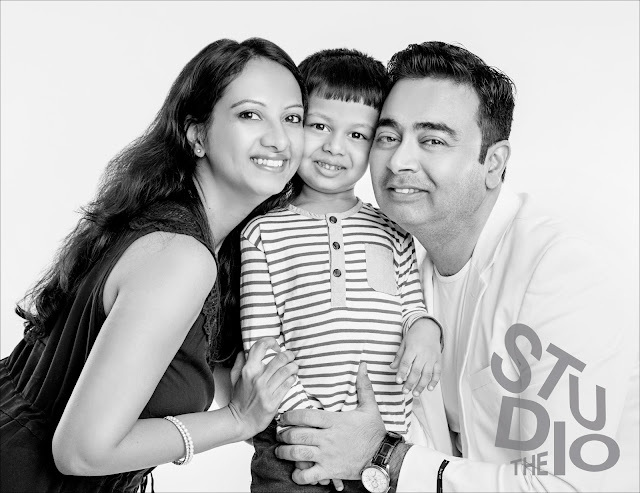 One such opportunity came up when we were offered a family studio photoshoot at The Studio Dubai. This awesome team of photographers and videographers is well known for their creative shoots, and are sought by families and corporates alike. This was our first time getting a 'proper' photo shoot as a family, and I looked forward to the experience. Nikka Ampil was our photographer, and specializes in family photography. When we got there, we were ushered into the studio itself. It took us a while to really 'loosen' up and pose naturally for the photos, but Nikka was helpful with handy instructions! We used minimal props, and I like that this put the focus on us as a family. We had brought along a change of clothes after one set of photos were taken. Nikka was quite efficient and the whole photo shoot didn't take more than 20 minutes. We had coordinated our own outfits and makeup. Although you could separately hire someone to do that for you, you could just as easily do it yourself if you are after a natural look. If there's something we would have liked to do differently, it would have been nice if we could have spent some time talking to the photographer before the shoot. This would have helped us relax a bit, and get comfortable in front of the camera initially. In over a week's time, The Studio Dubai sent us a gallery link where we could have a look at our photos, and choose how many we wanted. This was the hardest part! The photos had been worked on for lighting and colour, and looked amazing. If you choose the Portrait Studio Experience (AED 295), you receive one complimentary high resolution photo. You can also choose from image packages, canvases, frames, and albums that The Studio Dubai can get made for you. Details of the family photography packages can be found on their website. We asked for two high resolution photos to begin with, and received them a few days after. The final photos are beautiful! For each photo, we were given copies in both black & white, and colour. The Studio Dubai is located at The Courtyard in Al Quoz 1. If you haven't been in the area before, I highly suggest using GPS!